"With its automatic features and correction tools, DxO PhotoLab strives to help photographers express their artistic vision without compromising on image quality"
DxO, one of the world’s most innovative consumer imaging companies, has announced the release of DxO PhotoLab 2, a major update of its RAW processing software for Mac and PC, recently awarded the 2018 TIPA Award for Best Imaging Software. 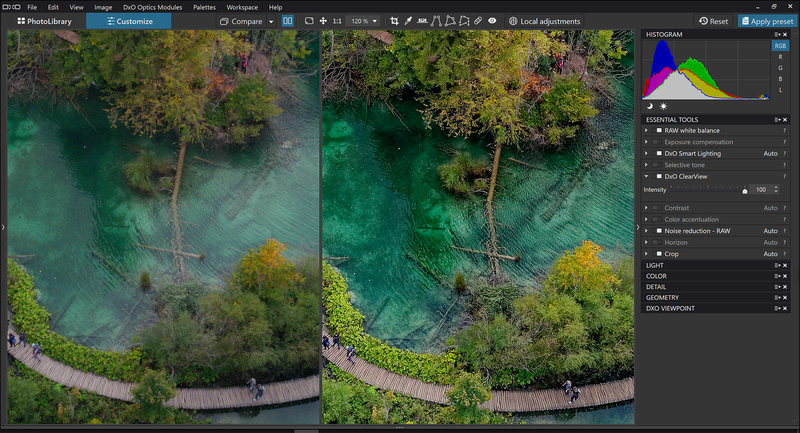 DxO PhotoLab 2 introduces ClearView Plus, the latest version of the software's incredibly effective haze removal and local contrast improvement tool, as well as DxO PhotoLibrary, a brand-new image and data management feature that lets users search, select, sort, and display images. DxO PhotoLab 2 also supports DCP color profiles, which maintains consistent color renderings across the industry's main programs. To provide photographers with all the tools they need to make local corrections, DxO purchased and integrated Nik Software's U Point technology into DxO PhotoLab. This exclusive technology, which millions of photographers enjoy, allows users to make complex selections in just a few clicks and apply local adjustments with Control Points, a unique system of equalizers and multiple correction tools. DxO PhotoLab is the only software to fully integrate U Point technology within a non-destructive RAW workflow. "With its automatic features and correction tools, DxO PhotoLab strives to help photographers express their artistic vision without compromising on image quality," says Jean-Marc Alexia, VP Marketing and Product Strategy at DxO Labs. "With the addition of DxO PhotoLibrary, DxO PhotoLab 2 has now advanced to the next level, giving users complete control over the image product process—from organizing photos to exporting them. By the end of the year, this new tool will incorporate additional search features, including keywords and many other criteria." DxO PhotoLab 1 can get a discounted upgrade license for DxO PhotoLab by signing into their customer accounts at http://www.dxo.com. A fully-functional, one-month trial version of DxO PhotoLab 2 is available on the DxO website: http://www.dxo.com/dxo-photolab/download/. For over fifteen years, DxO Labs has been developing some of the world’s most advanced image processing technologies, which have enabled over 400 million devices to capture the highest quality images achievable. DxO Labs develops multiple award-winning image editing software for Mac and PC, including DxO PhotoLab, a RAW conversion program featuring U Point technology; DxO FilmPack, a program that accurately reproduces the most iconic analog film effects; and DxO ViewPoint, the most sophisticated perspective and lens correction software available. In 2017, DxO expanded its catalog with the Nik Collection, a famous suite of seven creative plugins for Adobe Photoshop, Photoshop Elements, and Lightroom Classic. Steven I. Rosenbaum, S.I.R. Marketing Communications, Inc.
DxO, U Point, and Nik are brands owned by DxO Labs. Other trademarks and trade or brand names may be used in this document to refer to either the third-party owners of trademarks or to their products. DxO Labs makes no claims whatsoever with respect to the registered trademarks and brand names of third parties.